Aldi -- the German-based discount grocery that's basically the less-flashy cousin of Trader Joe's -- has developed a nearly Wegman's-caliber following of loyal customers on the strength of its extremely inexpensive line of organics, cured meats, frozen pizzas, and spreads. But it's also got a hell of a booze selection, including a crazy-inexpensive wine section to rival Two-Buck Chuck and a formidable beer aisle stocking 12 Aldi-exclusive brews, including imports, IPAs, and more. Aldi's beer is remarkably cheap and robust in its offerings. 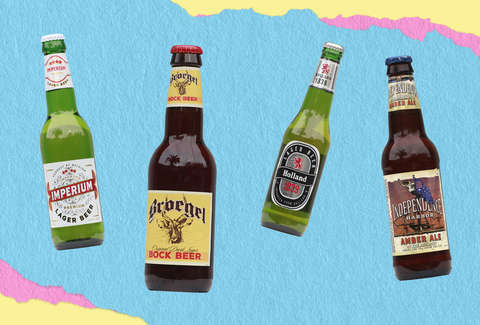 But which beers belong in your fridge? 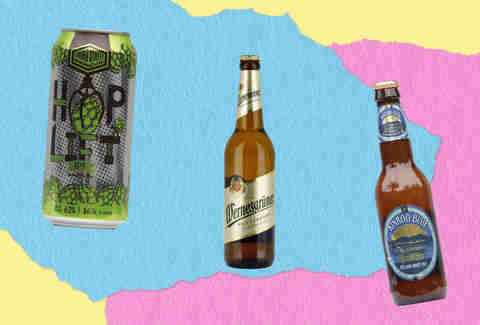 To find out, we enlisted Eric Sadovnick, certified cicerone and bar manager at LA's Arts District Brewing, to rank every beer during a marathon blind taste test. 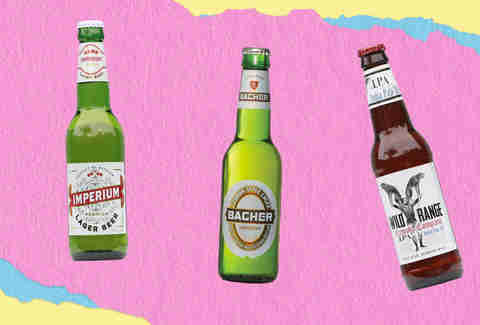 Sadovnick, who wasn't even familiar with the ever-expanding international grocer, found a lot to love among the 12 beers Aldi offers, and ranked them based on flavor, aroma, pairing-possibilities, and general enjoyability. Here's how they stacked up. Boot Tread, like many of Aldi’s Belgian options, comes from a brewery called Brouwerij Martens. And while it gives the promise of something that might satisfy and surprise beer nerds who freak out about any offering from the land of Van Damme, this particular geek was left underwhelmed. Sadovnick said the overall taste reminded him of syrup, both the sugar and the cough kinds. This slightly hoppy amber has a secret on the back of the palate courtesy of the addition of honey to the mix, which imparts a sweetness to the beer that’s either a benefit or a curse, depending on how you feel about heightening a beer's saccharine. Sadovnick wasn't a huge fan, but he was also not ready to outright dismiss it. It’s not a dud, and it really says something about these offerings that we’re only at #10 and our designated beer nerd already has nice things to say about Aldi's roster. Nothing super groundbreaking here, just a standard Vienna-style lager, and a solid one not far off from Modelo or Corona, really. Sadovnick notes that there’s very little aftertaste to the beer. It’s in your mouth, then it’s gone. And that’s kind of the point. “This is a great lawnmower beer,” he says, or one for the beach. Basically, this is a solid choice for an all-day beer for the fizzy yellow set. Right off the bat, Sadovnick noted that this one reminded him a bit of Heineken, but without that very Heineken aftertaste (the one that us plebs liken to skunkiness). And sure enough, this is kinda sorta the Aldi equivalent of Heineken: a straightforward lager designed to be crisp, clean, and ultra-drinkable. But wait! Holland has been around since, you guessed it, 1839, meaning the brewery that Aldi exclusively distributes to US palates is actually older than Heineken. It’s the kind of thing that blows your mind in the same way finding out Hydrox predates Oreos does, except when you make this discovery, it’s likely you’ve had a few drinks. Either way, this is a perfectly fine, but Aldi, as you’ll soon learn, rolls deep on the lagers, and has better choices up its sleeve. After the disappointment of the Boot Tread, Belgian brewery Martens rebounds pretty spectacularly with this relatively mellow take on the German-style bock. It’s not as roasty as many of its brethren, but the classic malt flavor is still plenty present, without the big alcohol blast that can come with more frisky versions of the bock. It’s not a best in show, but it’s a beer Sadovnick found himself enjoying more each time he revisited it, positively likening it to Shiner Bock ("It's like a great Shiner Bock cover band"). Even though it ranks lower for drinking, Sadovnick says it's hands-down the best beer for cooking. "If I was at Aldi and looking to cook something with beer, I would pick the Broegel. You're not getting any bitterness, but it comes with a lot of richness, so you can actually extract a lot of flavors. It's the best cooking beer out of all of them." Another effort from Rochester’s Custom Tap Brews, only unlike Folded Mountains -- which Sadovnick seemed outright offended by as time went on, hilariously -- and the strangely sweet Independence Harbor, our heroic cicerone actually perked up with this one. Sure, it’s more in line with a regular pale ale, but it harkens back to a time when an elevated IBU was all but essential in an IPA. It’s not some crazy, experimental, multi-hopped nerd beer. But it’s the perfect IPA to float over to somebody who’s just starting to dabble in more complex beers than the average tallboy. Consider it a perfectly acceptable gateway beer. Numbers 5 and 4 are remarkably similar in their profiles, both being straightforward Belgium-based, German-style lagers. But the slight differences in the two actually separate them down a pretty clear line. Sadovnick referred to it as clean and golden, but described it as "not very memorable, but very crushable... the kind of beer you'd bring to a party so you get credit for contributing. It's not memorable in a positive or negative way. It's not enlightening or offensive. It's just the price of admission. Everything about the flavor Sadovnick described in Imperium is here -- clean, crisp, biscuity, refreshing -- but Bacher is separated by what he calls "a little bit of nuance." He says to serve it on its own or with cheese and charcuterie (or lobster rolls). Moreso, this is the Aldi lager that you can be proud of. "Whereas the Imperium you'd put in the fridge right away at a party, the Bacher's like 'hey, I brought some Bacher!" Sold in 4-packs and rocking some legit branding, Third Street is definitely the most appealing to the hop heads in the crowd, though don’t confuse it with Santa Rosa, California’s (excellent) Third Street Ale House (this one’s made in Minnesota). Sadovnick immediately began talking about how it’d pair beautifully with carrot cake, which is a highly specific pairing that beer experts love to make when they’ve had a good IPA (he also recommends pairing with Thai food). Though it clocks in at 6.3%, it definitely has the mellow bite of a session beer, and elevates itself above the Wild Range IPA by going all in on the hops without overdoing it. This wouldn't be out of place at a beer bar. “It’s really fun to say... it might be my future dog's name,” says Sadovnick of Kinroo, which at first presents itself as Aldi’s take on Blue Moon, but quickly reveals itself to be a somewhat formidable take on one of the cicerone’s favorite styles. "It's very true to type," he says. "There's a nice, bright citrus essence from the orange peel and coriander. It's light-bodied with well-integrated spice notes, and extremely versatile with cuisine. It's an excellent bridge beer for people looking to get into beer a little more... it's so distinct, so people can hold onto the flavor notes a little more. 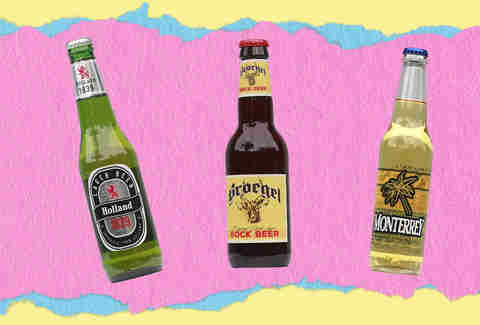 Personally, I think it's just as interesting if not moreso than the current iterations of Blue Moon and Hoegaarden." Aldi’s a German company, so it makes sense that it went all in on its store-exclusive pilsner. In fact, Wernesgrüner was founded in Saxony, Germany in 1436, a full century before the German purity law the beer claims to follow was established. And it’s a great version of the style, one that seemed to really take Sadovnick by surprise and became a clear favorite after the second sip. "It's a really impressive beer, and I think it stands up to dozens if not most of the international pilsners that have flooded the global market from Germany," he says, adding that the brown bottles and distinctive cardboard packaging go a long way in eliminating light contamination. "The malt and hops are so well balanced. It's true to type with a nice long finish and a depth of flavor. The aroma carries over to the flavor. 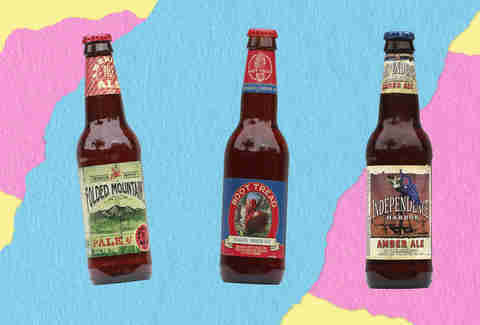 It's an excellent beer to not get too fussy about and drink on its own or pair with light-bodied cured or raw cuisine. It'd actually be great after a hike or bike ride." Andy Kryza is a senior editor at Thrillist who recently renamed his dog Kinroo. Follow him to confusion at the dog park @apkryza.